Timor 1887 5r Black. SG21. 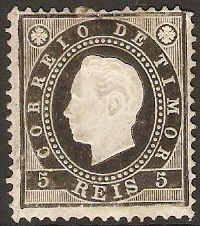 Heavy mounted mint 1887 5r Black. SG21. 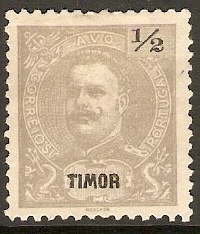 Timor 1893 2½r Brown - Newspaper stamp. SGN36. 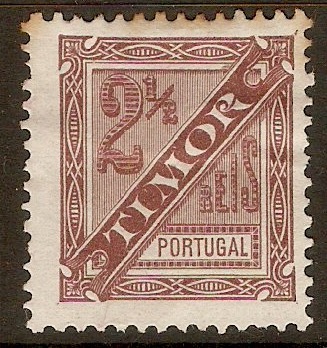 Some damage 1893 2½r Brown - Newspaper stamp. SGN36. Perf 11½. NOTE: Some foxing along top edge. 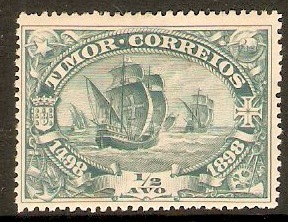 Timor 1898 ½a Blue-green. SG58. 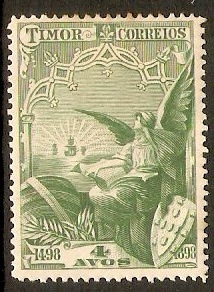 Heavy mounted mint 1898 ½a Blue-green. SG58. Vasco da Gama Anniversary Series. 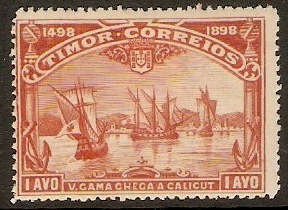 Timor 1898 1a Vermilion. SG59. Heavy mounted mint 1898 1a Vermilion. SG59. Vasco da Gama Anniversary Series. 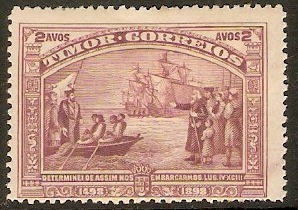 Timor 1898 2a Dull purple. SG60. Heavy mounted mint 1898 2a Dull purple. SG60. Vasco da Gama Anniversary Series. 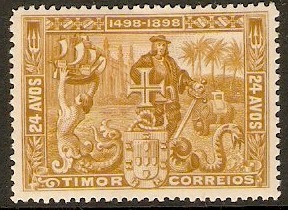 Timor 1898 4a Yellow-green. SG61. Heavy mounted mint 1898 4a Yellow-green. SG61. Vasco da Gama Anniversary Series. Timor 1898 8a Deep-blue. SG62. Heavy mounted mint 1898 8a Deep-blue. SG62. 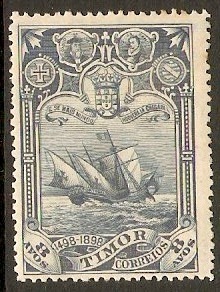 Vasco da Gama Anniversary Series. Timor 1898 16a Bistre-brown. SG64. Heavy mounted mint 1898 16a Bistre-brown. SG64. Vasco da Gama Anniversary Series. 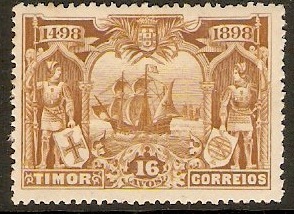 Timor 1898 24a Ochre. SG65. Heavy mounted mint 1898 24a Ochre. SG65. Vasco da Gama Anniversary Series. 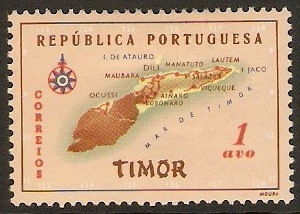 Timor 1898 ½a Pale grey. SG68. Mounted mint 1898 ½a Pale grey. SG68. Without gum version.